What is a dark frame? What do I do with my dark frame? What do I do if I don’t have dark frame(s)? Removing any “bias” in your image – that is bringing the black back. Want me to translate that: an unexposed area on your sensor should read as “0,0,0” for Red, Green and Blue but I will bet you you don’t get zero! This would probably be a good place to show you what a dark frame looks like. But you’ll be disappointed. Dark frames are usually quite black. So instead of showing you JUST the dark frame, here is the dark frame boosted to show the speckles from hell – though they may not be obvious. Here I have made the speckles more obvious by boosting the darks using Curves in Photoshop. At this level of detail there are not any obvious hot pixels. Dark Frame Overview – Boosted to show details. Note where the markers are – they are shown in the next frames. And next is the same dark frame zoomed to 3200% unaltered. Hover your cursor over the image to see the same area boosted using curves. Single Dark Frame (Linear Mode) Unmodified – or cursor over to see boosted version. Takeaway 2: There really is randomness! Now that we have noticed the randomness, we realize that if we average enough of these frames together we can get the average “bias” – that is the amount of offset above zero in the image. And if there are hot pixels, the good news is they will be in there too. But How Do I Use a Dark Frame? 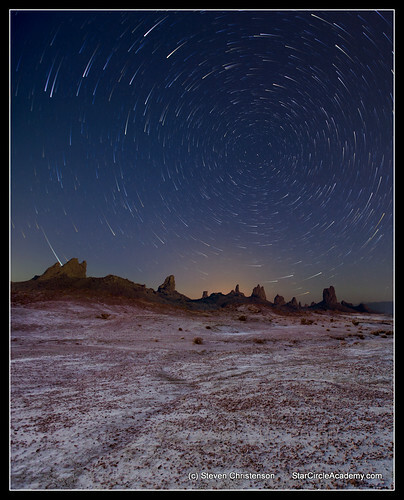 The simplest answer is to feed your dark frame(s) to a program that already knows what to do with them like StarStax, StarTrails or Image Stacker. But you can do it yourself, and perhaps more elegantly using Photoshop. How? Place the dark frame as a layer over the image you want to correct and change the blend mode to Subtract (or difference). Adjust the opacity of the blend until it looks just right. But I Did Not Take a Dark Frame, Now What? All is not lost. If you have enough frames you can create a unique kind of dark frame. 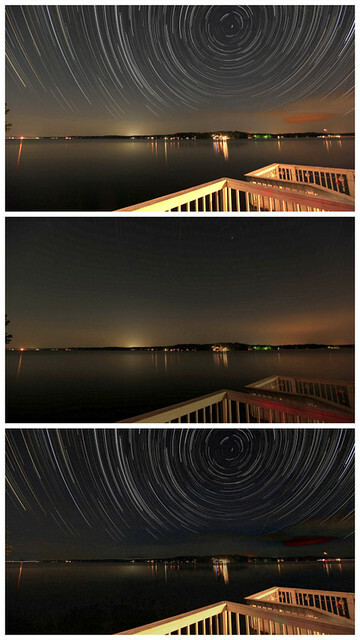 I took over 300 28-second exposure for a star trail along Lake Gaston in North Carolina. In the image below I created the top frame using the Brighten mode in StarStax. I could just as easily have created the top frame using the StarCircleAcademy Stacking Action. I used Darken mode to create the middle frame by feeding it my 100 darkest images. Using Darken mode as the stacking option means that hot or stuck pixels that are in every image as well as the lowest value of sky glow will be collected into a single result. I then loaded the light (Brighten Mode) and the dark (Darken mode) frames into Photoshop. I placed the dark image over the brighten stack and changed the blend mode to Subtract. The sky gradient caused by lights glowing in the distance was also almost eliminated. The red bias on the railing was mostly removed. A few less desirable things happened, too. The bright red glow on the railing once subtracted caused some of the railing to turn green. 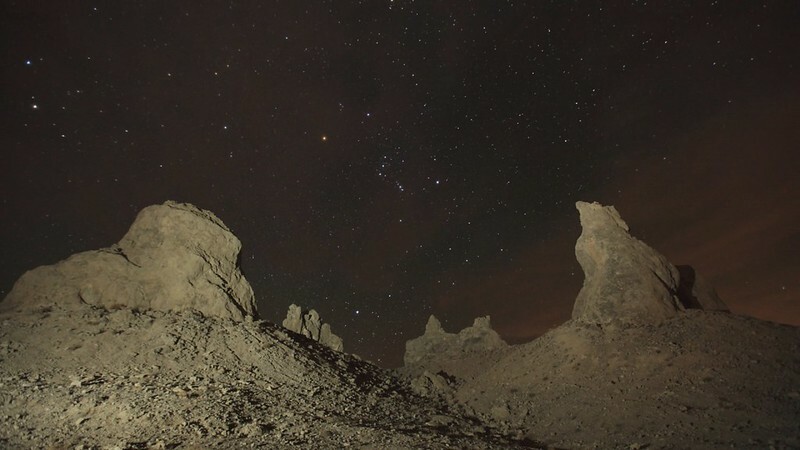 And the subtraction created some “holes” and “halos” in the image – especially where the brightest lights are found. With some minor touch up, most of those issues can easily be fixed. Is this the end? By no means! There are a LOT more interesting techniques to follow. Stay tuned. SHARE this on Facebook or Google+ You know you want to help your friend out anyway, right!? This entry was posted in Astrophotography, Camera, Composites, Creativity, Noise Reduction, Photo Tip, Stacking and tagged average, contrast enhancement, dark frame, darken skies, gradient removal, hot pixels, long exposure noise reduction, noise reduction, stacking, substitute, subtract on October 4, 2012 by Steven Christenson.